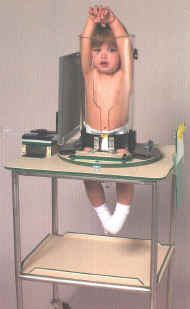 positioning system for radiographic exams. Both large and small supports have adjustable Velcro straps. The Pedia Graph Immobilizer is approximately 22" x 24"x 35" high. Welded stainless steel table with 3" casters. 2 locking casters - 2 non-locking casters. Engraved tabletop and shelf are made of durable polyethylene. Calibrated positive-locking turntable rotates full 360. Clear acrylic supports are furnished in two form fitting sizes. Proper anatomical design incorporated in use of Techni-Foam. Achieves womb-like warmth and security. Hugs rather than confines, resulting in maximum cooperation. 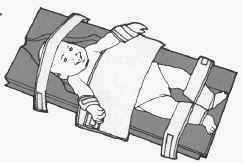 Infant immobilization was never so easy. Developed for specific use in neonatal radiology. 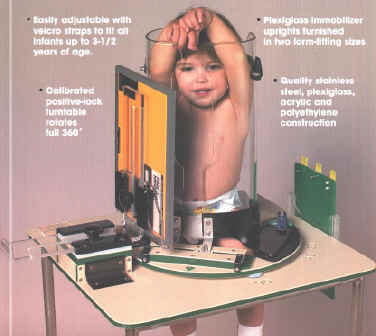 Completely immobilizes child in proper position for lateral and anterior-posterior radiology. Lightweight PlexiglassT with adjustable Velcro® closures. 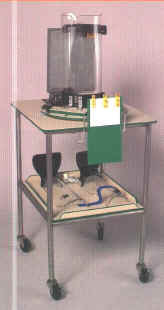 Vertical track and horizontal platform are capable of accepting cassettes. Incorporates immobilization concepts of the HuggerT. Basic physical design adaptations for CT use. Radiused base prevents possibility of artifacts. Aluminum equivalency below 1.5mm Total weight is 12 pounds. Contains: acrylic base, one child-size foam insert, one infant-size foam insert, complete set of universal restraining straps. Infant: premature born and newborn infants up to age three (3) months.